Verena Fischer was born in Wuerzburg. She received her modern flute education and training from Peter-Lukas Graf and Aurèle Nicolet at Basle. Already during that time she gave several concerts as soloist with the symphonic orchestra of radio Basle, followed by sound and TV recordings. She was flutist in the “Jungen Deutschen Philharmonie“ (Young German Philharmonic Orchestra) under Lorin Maazel, Charles Dutoit and Gary Bertini. Afterwards she worked as solo flutist for the South West German Philharmonic Orchestra at Constance for two years. Besides regular temporary jobs as solo flutist for the Philharmonic Orchestra Wuerzburg, in 1990 she started to concentrate on the baroque flauto traverso, while master courses with Wilbert Hazelzet, Barthold Kuijken and Konrad Hu?nteler completed her education. She worked with various baroque ensembles and from 1996 until 2006 she was the solo flutist of Musica Antiqua Cologne under Reinhard Goebel. Concerts with this ensemble brought her to the USA and Canada, South America, Asia, Israel and into all countries in Europe. As soloist she performed at many festivals, such as the Dresdner Musikfestspielen (Dresden Musical Festival), the Automne Musical Versailles and the Salzburg Festival. Many recordings of her with this ensemble were released by the Deutschen Grammophon/Archiv-Produktion, among others a flute concert from Friedemann Bach and the Flute Quartets from Georg Phillip Telemann. Last year two CDs together with Léon Berben were released by Naxos: The complete 12 Roman flute-sonatas and a collection of 6 Quantz sonatas. 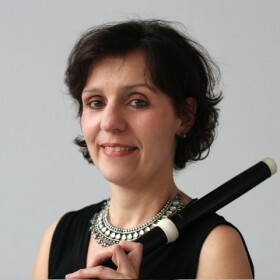 Verena Fischer is also specialized in the many-keyed flauto traverso with the music of the late 18th century. Therefore she has her own ensemble, concerto/würzburg, with whom she is invited regularly to several festivals. Also she is invited regularly to play in historical orchestras like “Wiener Akademie”, “Freitagsakademie Bern”, “Hofkapelle Muenchen”, „Ensemble moderntimes_1800 Innsbruck“.